We left the city early, at 7:30 a.m. on a Friday morning. The plan was to start at Hudson-Chatham winery in Ghent, our northernmost appointment, and make our way back to the city by the evening. It was a chilly morning in New York, especially for late March, but we were not prepared for what met us on the road. About halfway up, right around Stormville, NY (pun intended by nature perhaps? ), we drove into a snowstorm. Oh, it was pretty of course, once the shock wore off, with a touch of danger from the slippery road. However, we were rewarded by a lovely landscape as we pulled up to the winery itself. We were met by the owner of Hudson-Chatham Winery, Carlo DeVito, and he took us through the lineup as well as the history of the winery and the region. The winery is “old-fashioned” according to Carlo, everything is done by hand, pressed in an old wooden press, aged mainly in old French oak barrels. The winery is known for its hybrid grape wines, like the Baco Noir, Chelois, Leon Millot and Seyval Blanc. Partially this has to do with the harsher, colder climate of Columbia County, but that is not the only reason. Preserving the history of these grapes and the wine that was made from them is important to the winery. I, personally, have never had these wines before, and I was surprised at the quality and depth of the wines. While there is value to the idea of “uniqueness”, the wines must be good – and these were! We began with the 2016 Estate Seyval Blanc, an intriguing white grape created in the 1920s by Bertille Seyve and his son-in-law Villard, thus the name. The wine was light, with bright citrus and green apple notes, green tomato and hint of mint. We moved on to the Chelois, tasting two very different versions, one from the Casscles Vineyard and the Estate version. Chelois is another hybrid grape, developed in the late 19th – early 20th century to fight the phylloxera. It is a red grape that produces light, bright wines, with pinot-like fruit notes. The 2015 Chelois Casscles Vineyard had a pretty, translucent pink-with-orange color, with an earthy nose mixed with savory herb. The palate is light, with red berries and herbs, quite bright toward the finish. 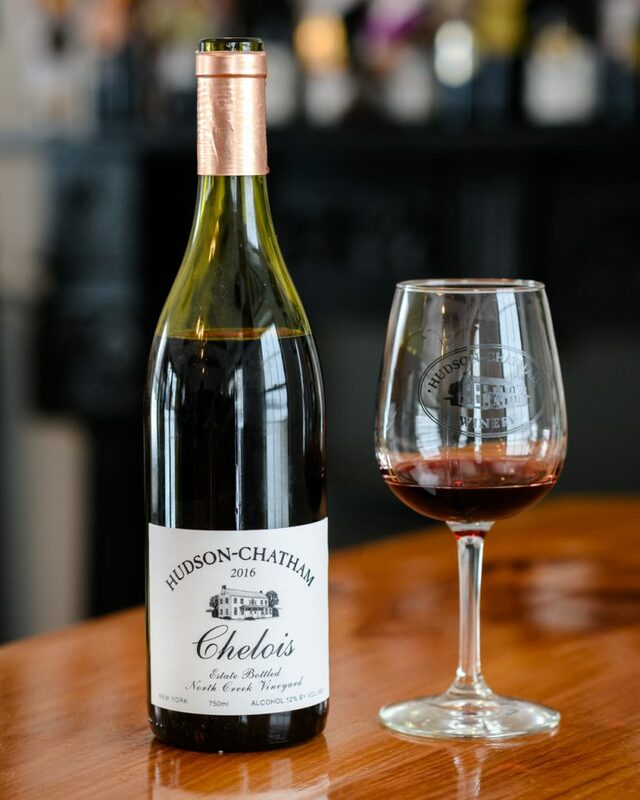 The 2016 Estate Chelois was significantly darker, riper and richer wine, with raspberry notes above the earthy and herbal tones. The mid is full of cranberry and red currants, iron and mineral notes. Its bright acidity is refreshing on the palate and leads to a chewy, mineral and tart cherry finish. I really enjoyed this one. We then moved on the grape that brought fame to the Hudson-Chatham winery in the first place: Baco Noir. Another hybrid grape from the late 19th century, Baco Noir earned its place by creating wines that have deep color and juicy ripe fruit while being quite hearty, able to resist very cold winters and ripen well in cooler climates. We tasted through five different wines made from Baco Noir. My two favorites were the 2016 “Old Vines” and the 2013 “Block 3”. The 2016 Old Vines Baco Noir opens with a rich raspberry, hint of cherry and an earthy, underbrush note. The mid-palate shows ripe cherry, with a very pinot-like savory herb toward the back, great balance of acidity and a grip toward the back. It finishes with a lovely tart cranberry note. The 2013 Block 3 Baco Noir, taken from the “cellar stash”, was an interesting look at how this wine can age. The nose was raspberry tea, bergamot, quite perfumed and floral. The mid was showing the same ripe cherry tones that I found in Old Vines, with sage and savory herbs. Long, tart cherry and spicy finish showed a hint of maturity, but was significantly more complex than the 2016. I am rather intrigued to learn more and taste more of these grapes. Our second stop was at Tousey Winery, only thirty minutes to the southeast, and yet completely out of the snow… oh well! We were met by Ben and Kimberley Peacock, the young owners of the winery. This is an absolute passion project for the couple, as Ben grew up in England and Kimberly, though born in the Hudson Valley, spent twenty years in Denmark. 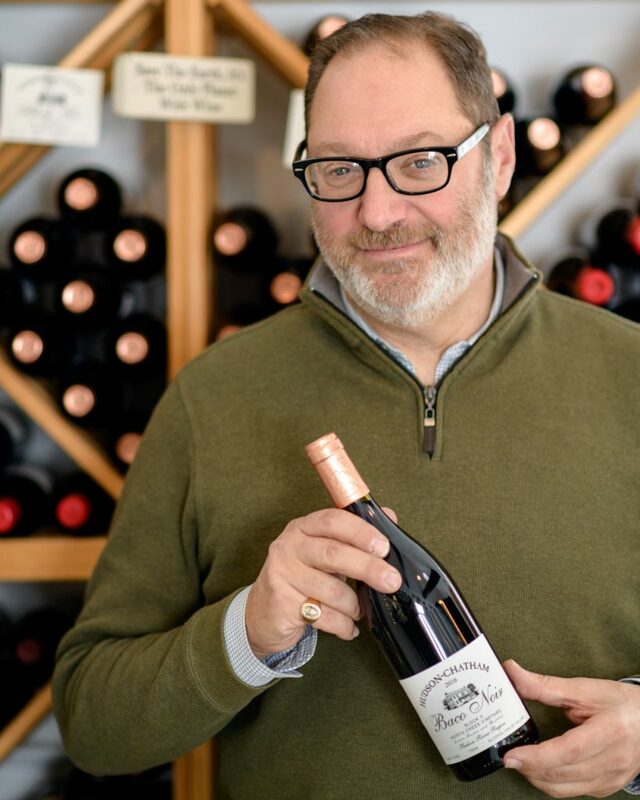 Kimberly’s father Ben Tousey, a honey farmer in Hudson Valley, created Tousey Winery to sell his “Crème de Cassis”, and when the young couple came for a visit – they saw the opportunity to create something of their own – a full-fledged winery, focusing on the vinifera grapes grown in New York. Building a winery from scratch took time, and effort – but I must say I was immensely impressed with the wines, and even more so, with the clear vision and passion I saw in Kimberly and Ben. The wines we tried were clear, bright expressions of the grape, while speaking of place, they also spoke of the grape itself, with a classic, old-world sensibility that shows a light hand in the cellar. They grow majority of the grapes themselves already, with 85% of the wine made from estate vineyards. We began with the Chardonnay, and the 2017 Tousey Barrel Fermented Chardonnay – the only wine Ben vinifies in American oak. He feels that Virginia oak “is a great marriage between the oak and the fruit” in this wine and I must agree. While I am usually not a fan of American oak, as it can often overpower the elegant New York chardonnay, here I was surprised to find that the hint of vanilla and coconut does not detract from the deep citrus and lemon curd of the wine. This shows a light hand with the oak, but also the beauty of the fruit. The green apple and lemon of the palate lead to pear and peach notes toward the finish that left a zesty impression with a hint of herb. This, with the next wine, are absolute crowd pleasers – and would match up with a variety of dishes seamlessly. The next wine was even more surprising, a bright and tropical Sauvignon Blanc. The 2017 Tousey Hygge was Ben’s present to Kimberly. 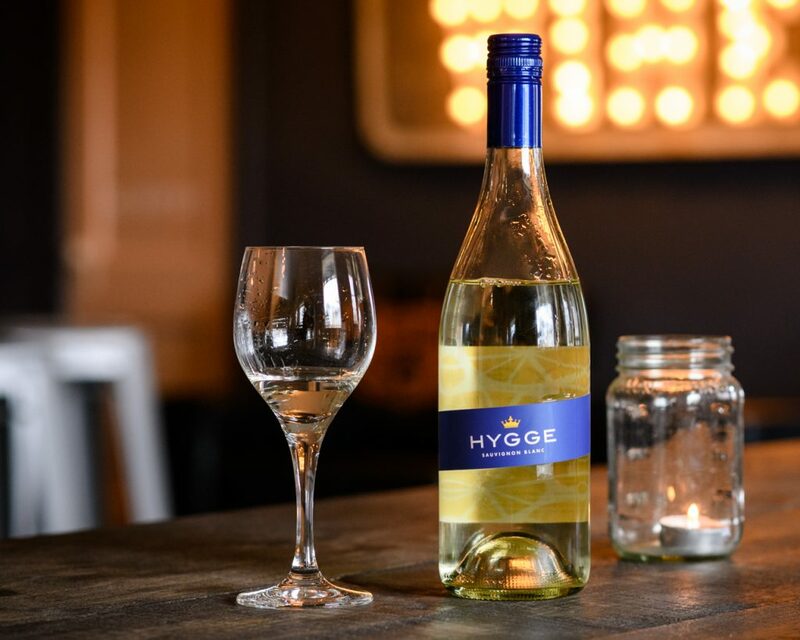 Hygge is a Danish concept, a feeling of comfort and coziness. Ben sourced the grapes from the Finger Lakes, as it is a better climate for Sauvignon Blanc. The label reflects Denmark as well – with its Royal Copenhagen Blue color providing a counterpoint to the citrus yellow. The wine itself, sadly sold out, is absolutely delicious, with a core of ripe tropical fruit, grassy, musky nose and a zesty, refreshing finish. One of the best Sauvignon Blancs from New York I have tasted. 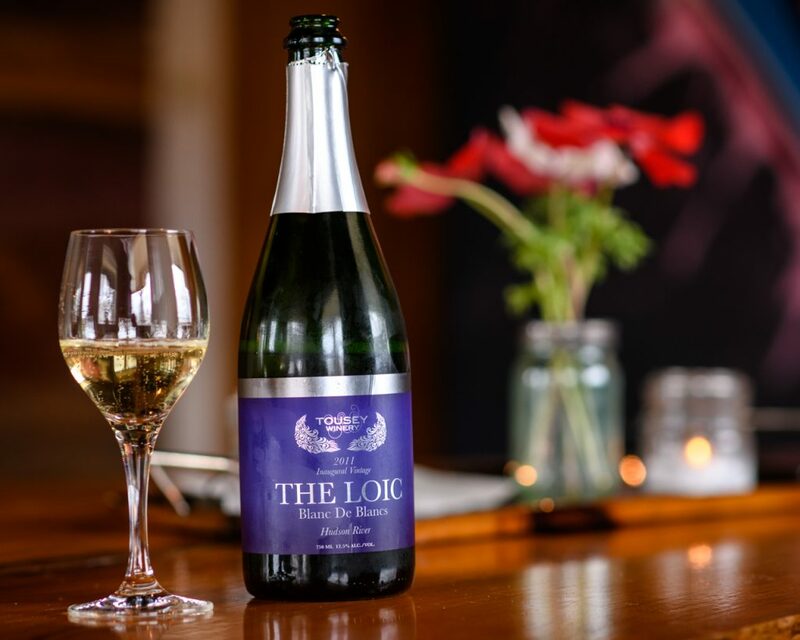 We then tasted several vintages of their Blanc de Blanc sparkling wine, The Loic. The 2011 Tousey Loic BdB (disgorged in 2014) was my favorite, showing green apple, citrus, brioche and earthy tones on the nose, with a core of juicy, ripe lemon and apple fruit, leaning toward cream in the mid palate. Absolutely delicious. We finished with two vintages of Pinot Noir, the 2013 that had some age and the recently released 2017. Pinot Noir is a wonderful, if difficult grape, and when done well, can really reward the grower and winemaker. I was impressed by both vintages we tasted. The 2013 Tousey Pinot Noir showed a touch of development already, with a floral nose of roses and violets, along with ripe cherry tones. There were hints of tar that reminded one of Piedmont. The palate was ripe with dark cherry, tart and refreshing, leaning toward earthier tones and spices toward the back. The finish was long with savory herb and earth. While I would not put this away for a decade, this is showing good short term potential and is an excellent example of cool climate Pinot. The 2017 Tousey Pinot Noir was the brasher, brisker brother of the 2013. 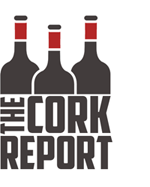 The lighter vintage showed itself in the redder, tarter cherry and cranberry fruit on the palate, with the back learning to sour cherry and pomegranate tones. The nose already showed a hint of earth, higher toned than the 2013, with the finish exhibiting touches of bitter almond and herb notes. I will be looking for more Pinots from Tousey! Our last stop of the day was at Fjord Vineyards / Benmarl Winery. Situated in Marlboro NY, just below Poughkeepsie, it is an easy ride from the city, and one that I plan on making again, once spring paints the hills green again. We were met by Matthew Spaccarelli, who took us first into the vineyards. 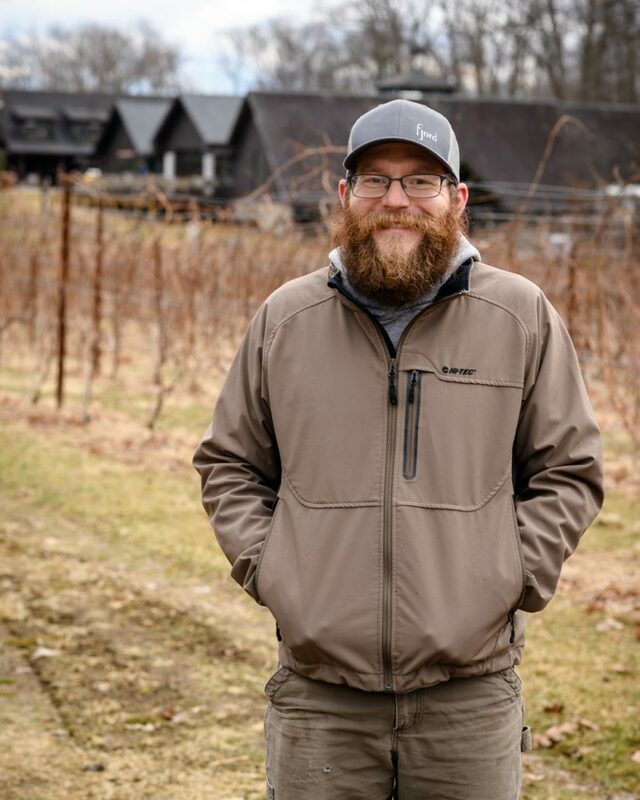 Benmarl is a historic winery, on 37 acres overlooking Hudson River – and Matthew is overseeing the replanting and recovery of its historic vineyards. The steep slopes of the hillside are sure to provide both the sun and the air needed to ripen grapes in the Valley, ensuring the continuation of the growth that the winery has seen in the past decade. 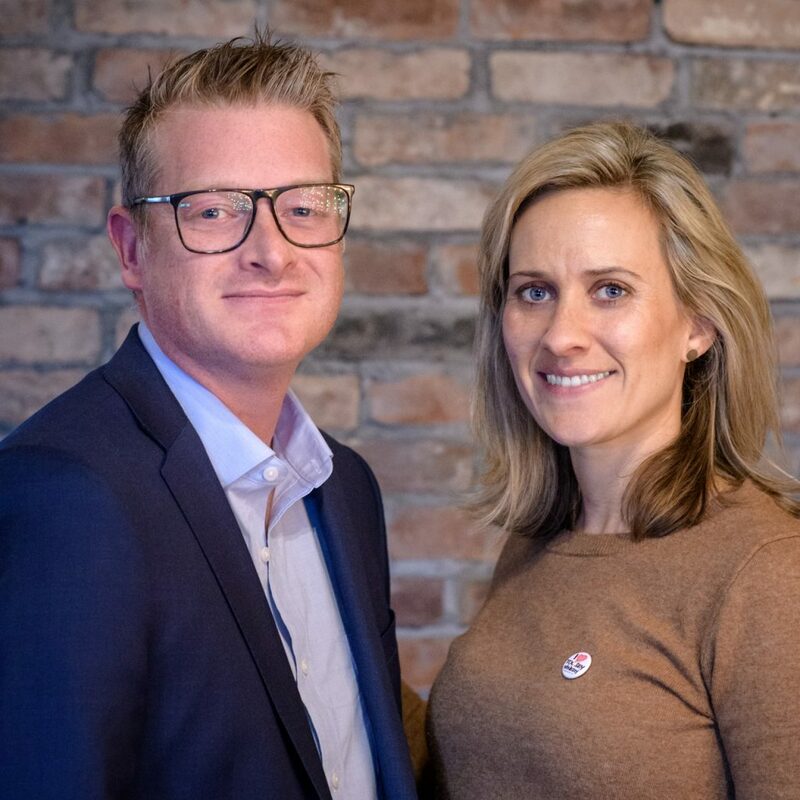 Fjord is Matthew’s own project, along with his wife, Casey Erdmann. It allows them to focus on the unique microclimate of the Hudson Fjord. After tasting a few wines from barrel, including two very different expressions of Cabernet Franc, we returned to the tasting room. 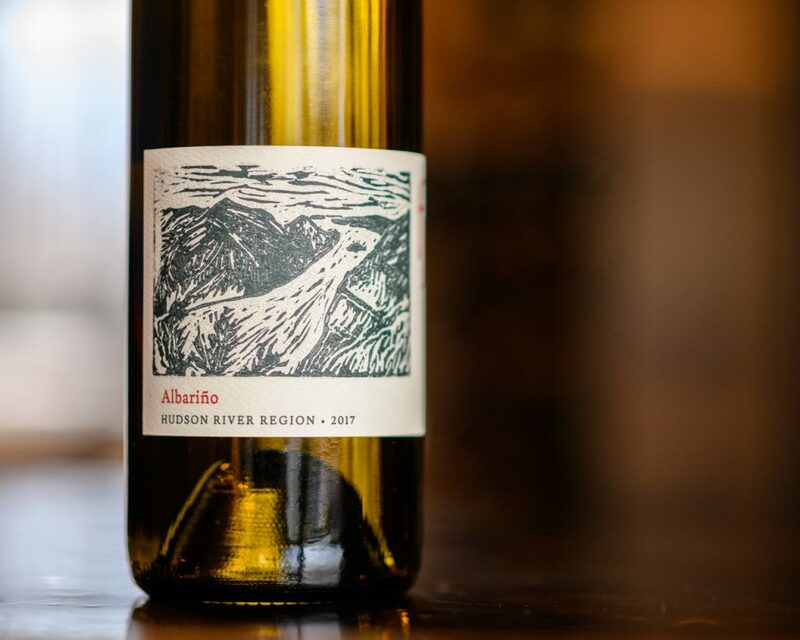 Even though I have had the wine before, I had to ask for a taste of the 2017 Fjord Albariño. This Spanish grape is known for the light white wines that provide fruit and refreshing brightness – a perfect summer afternoon. This one has that in spades, brimming with pineapple, ripe citrus and almond notes, it is a refreshing reminder that sunshine is not far away. We also tasted through several Benmarl and Fjord red wines. I found the 2015 Fjord Cabernet Franc to show well already, even though it is clearly young. The nose was ripe, with black and red berries and savory herb. The palate showed sweet tobacco leaf, blackberry and a note of bitter chocolate. I would give it some time to unwind, and it is sure to please. The 2017 Benmarl Merlot opened with hints of leather over the ripe black fruit. The palate was juicy, rich but balanced by savory herb and spice. Good medium finish was refreshing, with touches of black pepper and cedar. The 2017 Benmarl Proprietors Reserve, Benmarl’s Bordeaux blend, showed ripe blackberry, cassis and cherry on the nose along with hints of iron. The mid palate was broad, with tobacco leaf, textured tannin and ripe blackberry. This is a powerful wine, though quite approachable even in its youth.